"Sampath Speaking" - the thoughts of an Insurer from Thiruvallikkeni: Marina beach ~ and a good samaritan .. .. .. Early morning the famous Marina beach offers intriguing things. There are young, old, fast, slow, and varied people indulging in chit-chatting, eating and drinking the various health drinks ! that are sold on pavements. You can see people walking, walking fasting, jogging, sprinting, skipping, doing physical exercises, yoga, laughing out loud – more – all law unto themselves – thinking and spreading that these are the passport to good health. .. .. .. then there are many beggars too, waiting for rich to distribute food items, cash and the like ! This is no post on the beauty of Marina beach but on its people ~ the innate goodness. A couple of days back, watched with curiosity near Lighthouse, a gentleman talking to disabled beggar, asking him to get up (helping to) – thought he would dole out something, may be bread, biscuits (curiously have seen some giving mixture and the like !) - it just passed out. This morning occasioned to see him walk with a dozen or so crutches - talked to him and with his permission took this photo. 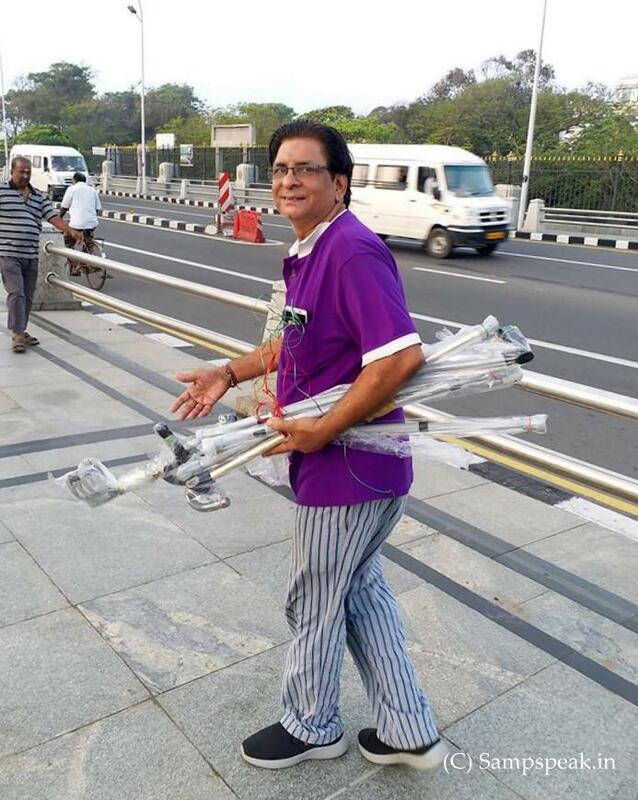 He is Mr Ashok from Sowcarpet .. .. he runs a medicine support business and today in remembrance of his father, he was seen distributing those walking-aids, (totally new ones) to those disabled beggars who would require that for walking. Noble act indeed ~ there are so many good Samaritans – may be we fail to notice !